This book is a ghoulish delight. Unlike other pop-up books that open in daylight, this one works best in a darkened bedroom with a blank wall and a flashlight or iPhone. The pages inside jump out at you as soon as you open it. Each of the eerie five pages has three layers of cut-outs in the shapes of triangles, circles, and strangely-shaped tree branches. 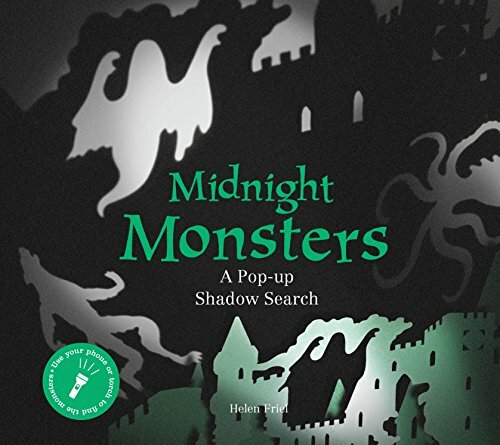 At the bottom of each page are scenes of white figures portraying monsters from around the world from the werewolf in the woods to the Krampus in the castle. Direct your flashlight or iPhone through these cut-outs, and ghostly figures creep up on the wall. We’re taken on a journey through the wild woods, creepy caves, mysterious mountains, a misty lagoon, and a haunted castle. Move your flashlight back and forth, and the spooky shadow figures also move. See if you can find all the monsters portrayed in the book. These monsters have strange names, such as Dingonek, Headless Horseman, Kraken, Kelpie, and Vampire. The book has captions to explain them. For example, the Hydra—“this many-headed marsh-serpent grows two (or more!) heads . . . making it nearly impossible to kill.” Children will enjoy the play on words such as Tikbalang and Grootslang and can make up their own stories. Teachers or parents should encourage them to do their own paper cut-outs and make up spooky names for their villains. The details in the paper cut-outs are so finely and ingeniously executed that they match the shapes of the hand-drawn figures, giving the illusion that they’re walking through the woods or castle when we shine a light. A caveat: Since the cut-outs are delicate, adults are advised to handle with loving care. This pop-up book is a must for Halloween. Carol Katz is an author and illustrator of children's books including Zaidie and Ferdele: Memories of my Childhood (Deux Voiliers Publishing). She has also written and illustrated a graphic novel, Mad or Bad: The Story of My Grandmother. Her short stories, poems, and articles have been published in various anthologies. She is a professional archivist.